The journey through Papua New Guinea continues . 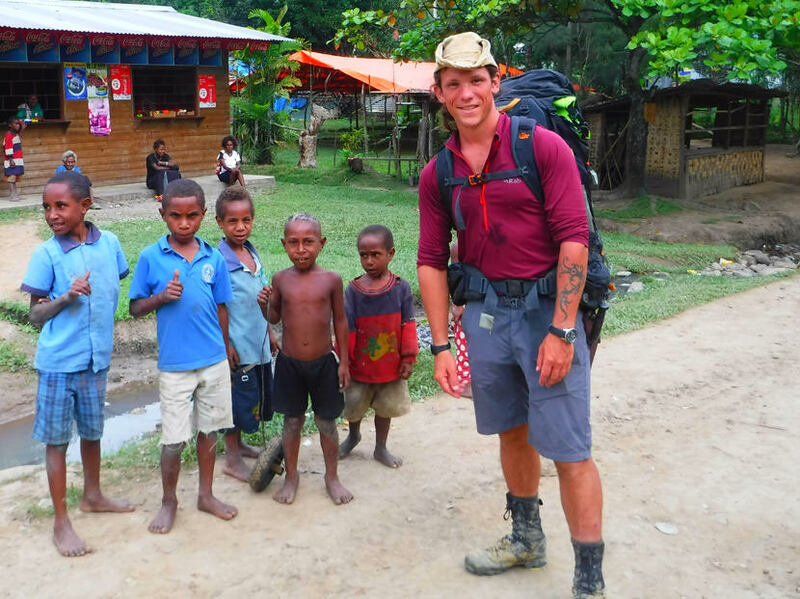 . .
Home/Live Blog/The journey through Papua New Guinea continues . . . The cataclysmic downpour that accompanied our mountain descent to Zenag had changed the bush tracks to ravenous torrents of water. We slipped, skated and fell our entire descent. By the time we had reached the settlement, we were soaked, exhausted and our bodies completely pulverized. Our cameras, sat phones and remaining electrical items were almost completely depleted from the extended period we had spent in the bush and “off the grid”. With our phones remaining battery we set to phoning one of the absolute legends that has been helping keep us safe whilst out in Papua New Guinea. Wayne Uechtritz is the living embodiment of Mick Dundee. A complete badass and all round nice guy. He has a exceptionally impressive lineage being the great-great grandnephew of Queen Emma; her sister (his grandmother) was Phoebe Parkinson married to Richard Parkinson the famous Anthropologist who introduced commercial agriculture to this wild island. Born in Australia and raised in PNG’s Markham valley, he is a seriously well-known and respected guy within New Guinea, and has been instrumental in connecting us with the right people as we have travelled through the countries various regions. He answered the phone after a couple of rings, aware of our situation he had already put something into place. He had dispatched the local coppers to pick us up and take us to his house in Lae. Here we would be able to charge all our electrics over the weekend, restock on vital supplies and could be dropped at our last location on the Monday to continue our traverse. In Zenag there is a huge chicken farm that employs a great deal of young men, being Friday, and PNG payday there were already a vast number of rowdy gangs, all wild eyed from booze roaming the streets, paying considerable interest in the 2 white carcasses that had hobbled out of the bush equipped with lots of shiny looking toys. We had an unnerving few minutes as we were surrounded by a drunken mob that seemed to grow minute by minute, all inspecting our gear and what we were wearing. Raucous shouts and laughter filled the air as they called yet more guys over with seemingly malicious intent. To our relief; the police arrived and like vultures spotting a lion, the group dissolved into the surrounding settlement, cackling loudly as they went. Once at Wayne’s, yet again on our trip we were shown unbelievable hospitality by a truly generous and kind human being. 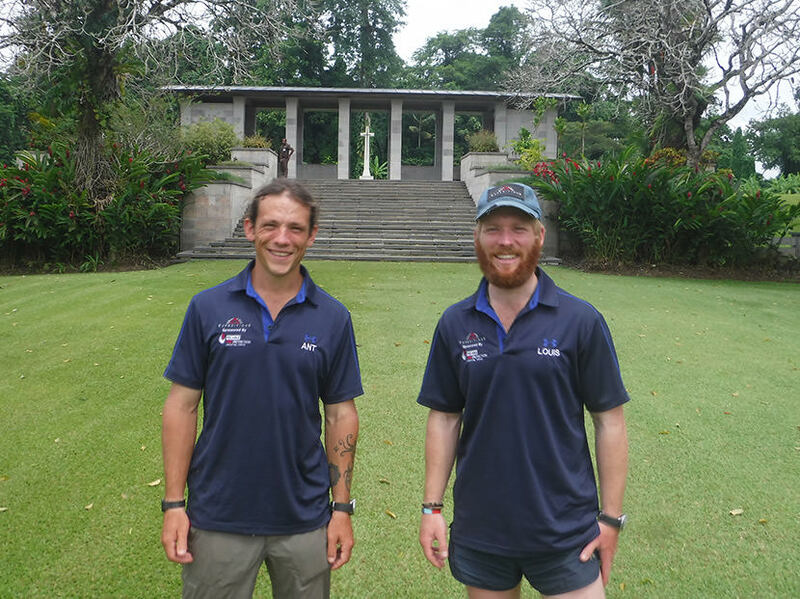 Over the weekend, he took us to the Lae war cemetery; a beautifully tranquil location, containing a large number of the allies who perished during the battles for New Guinea. We walked quietly amongst the spirits of the brave men buried beneath us. Our poignant reflection on the unimaginable horrors those lads must have gone through was distilled further yet by our shared experiences of war and in having witnessed the uniquely difficult environment that they were faced with. Next up Wayne took us to the main street market in Lae where many of the surrounding communities come to sell their produce. 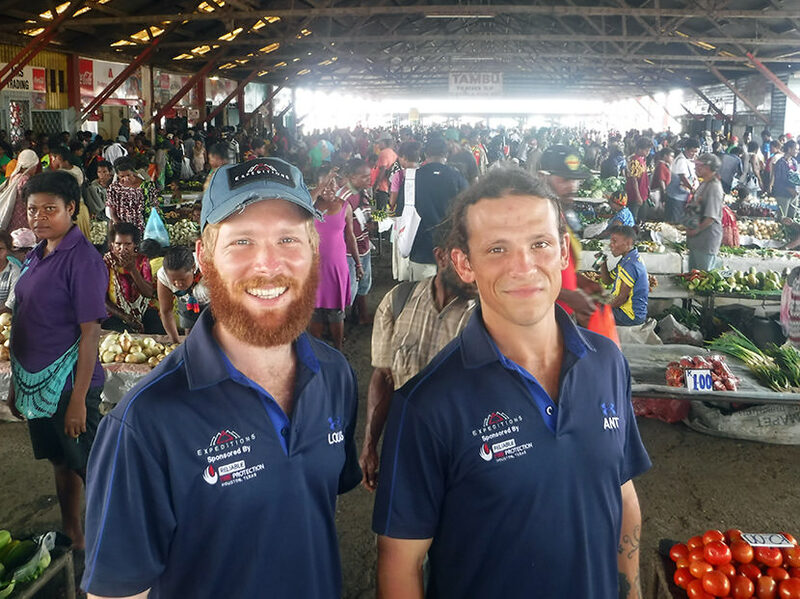 Within PNG, Lae has a reputation for being one of the more violent cities and Lou and I were extremely cautious. Wayne found 2 hardened war veterans threating over their safety within the city quite amusing, at well over 6ft with a genuinely friendly demeanour he laughed off our worries insisting we would be fine whilst we were with him, but to make sure we kept vigilant against pickpockets who “could steal our underwear” without us noticing. The chaotic hubbub that was the market was a throng of thousands, all bustling, inspecting the various items on display, haggling and arguing animatedly with each other. An eclectic medley of weird, wonderful, and unknown fruit and veg decorated the mass of stalls surrounding us. We revelled in the commotion, glad for once not to be completely broken by this time in the morning, and took in turns to try the more interesting looking items on display. Later, Wayne took us to his family home in the immensely historical Salamaua. Originally the Australian administrative capital, this beachside Shangri-La truly is paradise found. On a long thin strip of glorious golden sands, lined with towering lush palms sits of a mass of colonial era houses, all mostly occupied by the expat community. Once a bustling town, it was largely destroyed during WW2, now it is nothing more than a lazy weekend base. The place is infused with history, after it was seized by the Japanese the town and its surrounding primordial jungle were the scenes of some of the bloodiest fighting in the Pacific. The Aussie Commandos, vastly outnumbered and outgunned made the surrounding wilderness their home, preying on the Japs with stealth and guile the commandos developed such a fearsome reputation the Japanese were fooled into thinking the Aussies had thousands more troops then the mere hundreds they originally possessed. Our initial intent was to follow the route of some of the most intense fighting around the settlement, a former gold miners trail known as The Black Cat Track. However, in 2013 a group of Australians following the trail were targeted by a gang of thieves. The attack was exceptional in its violence which a left several of the group hospitalized and 2 of the local guides dead. The young woman who was leading the group displayed incredible bravery and calmness after the attack by leading the group to safety. Wayne who is good friends with the lady was heavily involved with the extraction of the group and trying to save some of the guides. He has been spending a great deal of time and resources trying to improve relationships between the villages along the track who have been blaming each other for the attack. Justifiably upset and angry, he spoke with us regrettably about the whole incident. The event kicked off a series of tribal clashes between the villages and the trail has remained closed to outsiders ever since. We spent a fantastic day and night in Salamaua, learning all about it’s fascinating history and being shown the traces of WW2 that remain to this day (Craters, anti-aircraft guns, Japanese tunnels) It was welcome relief to our aching bodies, and gave our multitude of infected mosquito bites time to recover. Sitting on the warm golden sands, watching the radiant sun set into the shimmering turquoise sea gave Lou and I perfect time to reflect on our journey so far and on what was to come. Despite the dangers faced by such a complex country, we both agreed it has been an eye opening and life changing pilgrimage for us both. The Land of The Unexpected truly is what it says, and without a doubt one of the last real frontiers left on earth. Also, along for the trip Salamaua was Chris Smith. He was the police contact we had been put in touch with. Over the course of the day he told us of his 23 years working as one of the only “white” coppers in PNG, needless to say he was armed to the teeth and had many stories that would make the hairs on your neck stand on end. The leg we were due to start on Monday was the last to take place on a highway. 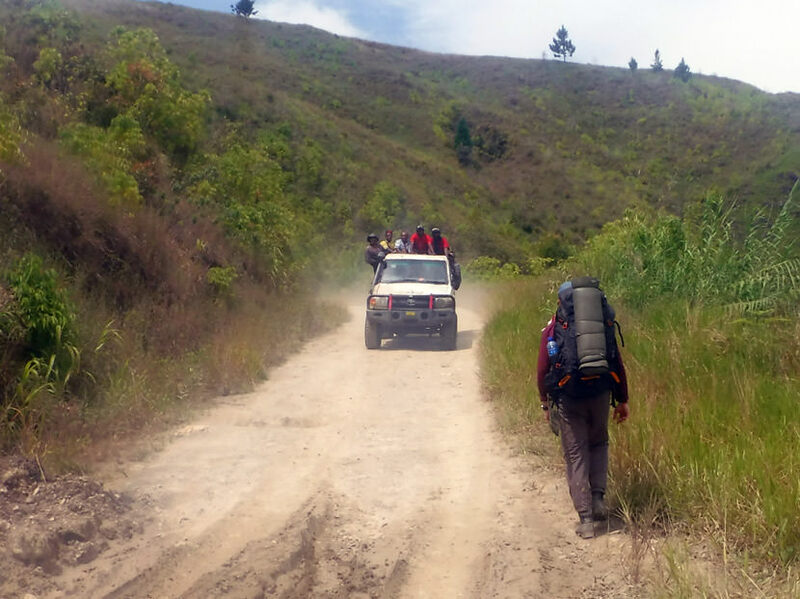 The Lae/Bulolo road is another notorious stretch within PNG and after hearing our plans Chris told us he would arrange “something” to keep us safe. That “something” came in the form of James and Gibson, 2 of the scariest looking policemen I have ever seen. Batteries and bodies fully recharged on Monday we were collected from Wayne’s by the pair complete with 12 gauge and an assault rifle. They were under strict instruction to shadow us until we re-entered the bush. Cheers Chris! Wayne bade us goodbye, not before loading us up with enough food to last us several days, and the last of his Aussie army rations. The man is an incredibly rare breed and we both left proud to call him a mate. Once back to our last location in Zenag we hopped out of the land cruiser and began to walk. Each glance back we would see our eagle eyed over watch calmly scanning the surroundings weapon in hand. The wealth bought to the area was apparent as we yomped. Many villages were a mix of bush material houses intermingled with much more expensive and durable long lasting structures. With money comes problems, this can be no truer than in somewhere like PNG. The various tribes in the area are all competing and fighting for territory to control the lucrative and finite resources the land processes. Despite that, and even with us accompanied by the police (who have a fearsome reputation in the country), we were shown nothing but kindness by the locals as we journeyed through this remarkable area. That evening we reached Bulolo, and were accommodated by a gnarly old Aussie called Kevin in company accommodation owned by PNG Forest Products. He had been in New Guinea over 30 years and regaled us with stories of being the first white man to play in many of PNG’s provincial rugby teams. The following day we made it to the mining frontier of Wau; The settlements architects seemingly drew inspiration from a spaghetti western. It was surrounded by soaring peaks over 2000m high, clad with thick treacherous jungle, and despite man’s attempt at taming the area, it still remains a spectacularly wild place. The gold rush experienced by this remarkable town in the 1920s/30s meant for a while it’s small grass airstrip was the busiest airport on earth. During WW2 it was as far as the Japs managed to push, with the Aussies valiantly managing to hold on when the numerically superior had made it as far as the airstrip. Most military historians are in agreement that if the Japanese had succeeded in taking Wau, New Guinea would of fallen and left Australia open to invasion. That evening we were accommodated by a gentleman John Rich in a company compound owned by a mining exploration company, he was wise old Australian prospector who had been in PNG most of his adult life. We spent the evening sipping coffee with him being entertained with tales of the very first Wau prospectors who loaded gold by the shovel load from the rivers without even the need to pan. Lucky gits. Our white faces must of given it away. We were heading towards another WW2 trail that is fairly popular with expatriates, however our intention was to reach it through going through a lesser known patch of jungle. Our new acquaintance was called Hennis, and was a self-proclaimed gangster and bad guy, but came across as more of a lovable rogue then anything really nasty. We agreed to take him on and planned the following morning to depart on what would be our final leg; The bulldog track and the race to the coast. We were accommodated in a small bush house, with Hennis cooking us our dinner; a delicious helping of Ibyka leaf cooked in bamboo and all the sweet potatos we could eat. Dangerous ‘Highways’ for lone expeditioners! The monstrous mountains and jungles that surrounded Winima were beckoning us, we would be re-entering PNG’s feral hinterland for the climax of our epic journey. Over the course of our incredible journey we have had instances where we have been broken, alone and scared. For every up we have, there are many lows and demons we both have to face along the way. Times like these we remind ourselves and each other of the remarkable thing we have set out to accomplish, and how so many men and women would gladly fill our shoes. The charities behind what we are doing are 2 remarkable organisations that significantly improve the lives of injured servicemen and women. Our goal in completing this journey is to raise as much funds as we possibly can for these 2 charities and hopefully inspire you guys at home to donate a few quid to a noble cause. By Kieron Brogan| 2017-05-14T18:33:32+00:00	May 14th, 2017|Categories: Live Blog|Tags: Lae war cemetery, Papua New Guinea, Wau, Zenag|Comments Off on The journey through Papua New Guinea continues . . .
Kieron updates the website from the comfort of a warm, cosy, safe office while the lads are out on the most difficult, dangerous and demanding expeditions. Kieron is in awe of them and does a little bit to support them so that they can support and raise funds for two amazing charities and make a difference.